Coastal Style Fabric Bundle – This week’s giveaway! Is your style Coastal? Do you love whites, and blues, and sea foam green, and aqua, aqua, aqua? Does the salt air make you swoon, and the rough texture of rope catch your eye? In my new book, Bedroom Style, Perfectly Pieced, coastal style is one of 5 featured design styles–and I give so many tips on how to achieve that beachy coastal style you’ve admired on your favorite blogs and home decorating shows. Coastal style is beautiful, and extremely popular right now, so jump in make your room the perfect shoreside oasis. 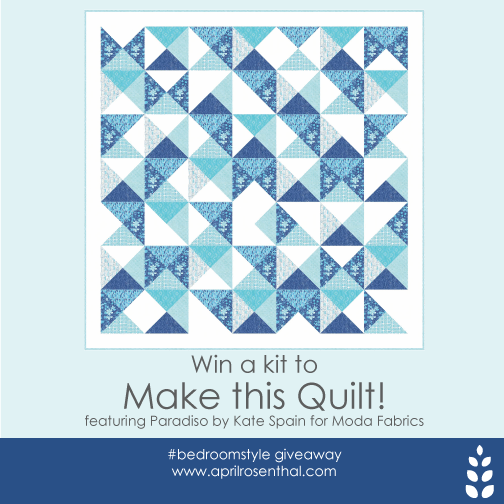 I chose a beautiful fabric bundle from Kate Spain’s upcoming Paradiso collection for Moda to give away this week–so you can make your very own Breaking Tide quilt. 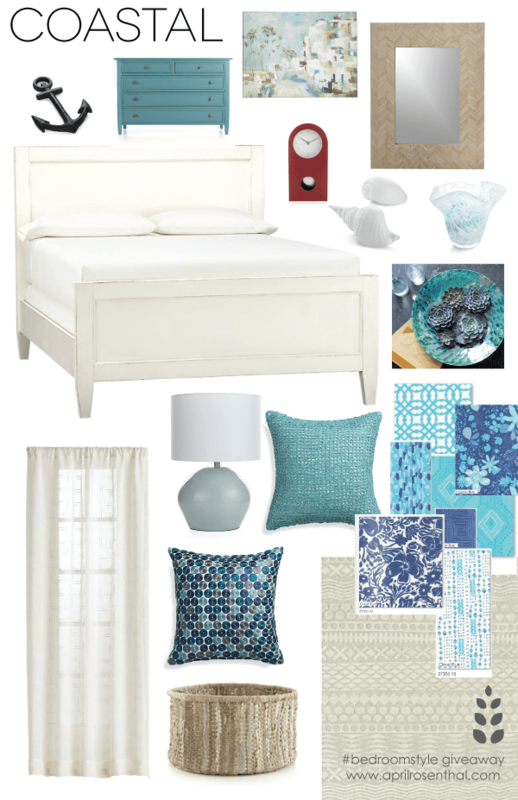 A simple pattern with big impact, Breaking Tide is the perfect complement to your bedroom. And look at the beautiful accessories you could win to complement your new coastal quilt! Be sure and get your entry in before this Saturday, January 24th at 12:00 CST to be eligible to win this beautiful Coastal quilt kit–AND the $1000 Crate & Barrel Bedroom Makeover! Still need a copy of Bedroom Style? You can order it on Amazon, or snag a signed copy from my shop! Hi April. Quick question…if I order your book tonight, I most likely wouldn’t have it in hand in time to take a picture of it in my room. What can I do? Thank you! HI Shannon! If you have Amazon Prime, you can get free 2 day shipping, or depending on where you live, I might be able to ship it to you in time. 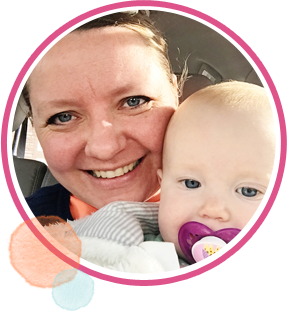 If not, you could probably print a picture of your receipt and take a picture of yourself with that in your room…whether you make it in time for the Saturday drawing, for sure still enter! I’m doing 4 more bundle giveaways before the grand prize giveaway on the 28th of Feb! April, thank you for the response! I still haven’t purchased it. We are in the middle of a HUGE move across the world. I really want the book and to play along to win. :) When you mail it, does it go priority flat rate? I’m in TX. Love the coastal look. My bed is white and walls are blue. Need some help with the rest!! Kate Spain does such great fresh designs. This is a great pattern. I like if because it’s not too girly…my husband doesn’t like frilly things. been watching for the Go Four It info. Sorry I can’t play, my budget is tiny (disability) and I am supporting my two grandgirls (3 & 5) just now.